The Undersea Hunter Group operates a world-class liveaboard diving adventure to Cocos and Malpelo Islands. Their vast experience, one-of-a-kind platform, and latest technologies provide adventure divers, filmmakers, and scientists with what may be the most successful, unique, and rewarding dive experience of their lifetime. Before you commit to your next vacation, you should really check these guys out. Based out of Costa Rica, the Undersea Hunter Group, with their three liveaboard boats, Sea Hunter, Undersea Hunter, and Argo, as well as their submersible DeepSee, offers unparalleled adventure diving experiences to remote Cocos Island and the Island of Malpelo. While scuba diving at Cocos Island is comparable to that at other Pacific, Indian, or Red Sea dive sites advanced scuba diving at Cocos is recommended and divers should have at least 25 hours of diving experience. You will be required to present proof of your diving certification and any other certifications you may have, such as for Nitrox and rebreathers. At a minimum, your certification must certify you to dive to the recreational dive limit of 130 feet (40 m.). The average water temperature ranges between 79°F and 84°F (26°-29°C). Occasional thermoclines can make the water temperature a few degrees cooler. Because of the water temperature and the number of dives you may do each day, including night dives (up to four), it is recommended that you use a 3-5mm. wetsuit. The average annual surface temperature is 74.5°F (23.6°C), but it can drizzle and get cool at night.Cocos Island, home to the renowned Cocos Island Marine Park, is located in the Eastern Tropical Pacific, approximately 345 miles (555 km.) southwest of Costa Rica. Tales of buried pirate treasure have attracted many expeditions over the centuries and created just as many legends. It is believed that Daniel Defoe placed his character Robinson Crusoe on an island accurately described as Cocos Island, and the events in the novel Jurassic Park occurred on an island very closely depicted as Cocos. Cocos Island was designated by UNESCO as a World Heritage Site, considered “the most beautiful island in the world” by famed oceanographer Jacques Cousteau, and, because of the amazing marine life in the waters surrounding the island, named one of the ten best scuba diving sites in the world by the Professional Association of Diving Instructors (PADI). The island, with its irregular coastline, is approximately five miles long by two miles wide, and is characterized by mountainous peaks, waterfalls, and extraordinary verdancy. Marine life concentrates here from hundreds of miles around. 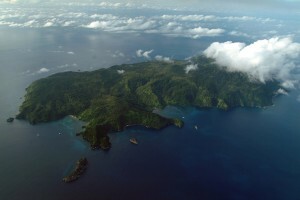 The climate at Cocos Island is unique in that it is the wettest place on the planet, receiving an average annual rainfall of 275 inches (nearly 7,000 mm.). All this precipitation produces lush foliage and creates upwards of 70 waterfalls that vary in size according to the season. Additionally, Cocos has an extraordinary ecosystem with characteristic flora and fauna and also a high-altitude cloud forest that is unique to this island in the eastern Pacific. Combined, this makes Cocos Island a very beautiful, dramatic locale with crystal blue waters. The rainy season occurs from May to December, and along with it rough seas and strong currents. These conditions, however, bring with them the largest animals, which is the main dive attraction at Cocos Island. The best months for sighting Hammerhead Sharks are June, July, and August, while March and April are typically the worst. Visibility averages 60-100 feet (18-30 m.). You will experience the best dive action at 60-90 feet (18-27 m.), and many dive depths range from 60 feet (18 m.) to 130 feet (40 m.), which is the safety limit. For this reason, dive computers are required. We always recommend using nitrox to increase dive time and also to ensure safety and maintain safe, non-decompression dives. Nitrox training is available on board. At Cocos Island you may visit up to 20 possible dive sites, conditions permitting. Your first dive might take place at Manuelita Coral Garden, a well-protected site with little current. At depths ranging from 20 to 70 feet (6-21 m.), you will experience countless fish, Garden Eels, Lobsters and more residing in the hard coral reef and sand slope. Other marine life present here includes White- and Black-tipped Sharks, Manta Rays, Marble Rays, Eagle Rays and Turtles. On the ocean side of Manuelita you will find various cleaning stations at depths of 60-130 feet (18-39 m.). From behind huge boulders, divers can watch the cleaner fish clean the approaching Hammerhead Sharks. You may also see Black- and White-tipped Sharks, Jacks, Yellow Fin Tunas, and Whale Sharks at this site. Diving at Dirty Rock, with its dive depths of 20-130 feet (6-40 m.), has been compared to diving the Grand Canyon. The dive at Dirty Rock brings divers back to Cocos Island again and again. This is one of Cocos’ most spectacular rock formations with enormous boulders and pinnacles. It is replete with a huge variety of critters that will make this one of your most dynamic dives of the entire trip. Some of the marine life you may see includes Hammerheads, White-and Black-tipped Sharks, Mobula Rays, Eagle Rays, Manta Rays, Jacks, Dolphins, Turtles, and Whale Sharks. The main attraction at the Dos Amigos Grande (Big Dos Amigos) dive site is the magnificent arch at depths of 70-110 feet (21-34 m.). Dos Amigos Grande is the largest rock on the southern side of Cocos Island. The arch shelters a variety of diverse, brilliantly colored critters including Lobsters and Snappers. You will also see Marble Rays, Hammerhead Sharks, and Mobula Rays here. Dos Amigos Pequeño (Small Dos Amigos) is located at the southernmost part of the island. During the rainy season, the rough surge at this dive site makes access difficult, if not impossible. When dive trips to Dos Amigos Pequeño can be made, you can expect to be surprised by whatever the open sea current brings with it, as this is the place where the current first reaches the island. Dive depths range between 60-120 feet (18-36 m.), and the marine life you may see includes Dolphins, Silkies, Hammerheads, Mobula Rays, Eagle Rays, Whale Sharks, and White-tipped Sharks. The third of the Dos Amigos dive site, Bajo Dos Amigos, meaning Lower Dos Amigos, is a seamount in the shape of a crown. Diving at this site occurs only during the dry season due to the strong currents that are usually present. While not an easy dive, at depths of 100-130 feet (30-40 m.) this is the only site where colonies of black coral can be watched safely. Dive depths at beautiful Shark Fin Rock, so-named because of its resemblance to a shark fin, are kept to between 40 and 120 feet (12-37 m.) because there is often heavy surge present at this site. At this mammoth underwater rock formation, you likely find a large school of thousands of Bigeye Jacks as well as an active colony of large but friendly Marble Rays swimming around. You will also find White-tipped Sharks, Mobula Rays, Eagle Rays, and Dolphins. Submerged Rock is a magnificent arched hole where, at depths of 50 to 70 feet (15-21 m.), photo opportunities abound. The scenery at these depths is stunning with its vibrant colors. White-tipped Sharks use this peak as a nursery so you may also have the opportunity to see pregnant females and tiny baby sharks. Look for Black-tipped Sharks, Mobula Rays, Hammerhead Sharks, and Marble Rays here as well. Advanced divers will love Bajo Alcyone, the famous seamount known for its populations of spectacular pelagics, in particular Hammerheads. With dive depths ranging from 90-120 feet (27-36 m.), other marine life at this site includes White- and Black-tipped Sharks, Whale Sharks, Eagle Rays, Marble Rays, Manta Rays, Mobula Rays, Sailfish, Silkies, Yellow-fin Tuna, Wahoos, and Dolphins. The variety of underwater scenes includes shark cleaning stations and octopuses among the rocks on the reef. You will truly need to dive this site to believe it. Another shark cleaning station can be found at Silverado, where Silver-tipped Sharks come to be picked clean. Dive depths here are 30-40 feet (9-12 m.). Look for large White-tipped Sharks lying on Lobster Rock’s rocky reef, where you can easily approach them. At depths of 90 to 120 feet (27-37 m.) you may be lucky enough to spot a Rosy-lipped Batfish in the sandy area around the reef. Other varied marine life you may see here includes Garden Eels, Frogfish, Manta Rays, Marble Rays, and Eagle Rays. Bait balls are another amazing phenomenon that can occur at any time. When threatened by predators, small schooling fish swarm in spherical formation in defense against large predators looking for food. This swarm, which appears to be a large silvery ball, is intended to confuse predators that may not want to attack a large group of fish. Counterproductive to their effort, however, is the attention a bait ball draws to larger predatory animals and seabirds such as Boobies and Frigatebirds, who may attack, forcing the fish in the bait ball to scatter wildly in all directions. Scuba diving at Cocos Island is utterly amazing. You will see more sharks here than any place else—at least eight different types visit the island regularly, and hammerheads reign as king. There is a constant presence of Dolphins and Tuna. Great quantities of Lobsters, upwards of 50-60 at a time, can be seen on both night dives and daytime dives. You may see dozens of Rays on every dive. Small sea life abounds, including Shrimp, Sea Urchins, Sea Stars, and Eels. In addition to enjoying incredible scuba diving, you may want to arrange to take an excursion to the island. With the exception of a permanent ranger station at Chatham Bay, Cocos Island is uninhabited. The degree of biodiversity here, however, is astounding. Numerous species of endemic plants, insects, birds, and reptiles populate the island. Amazingly, freshwater fish survive in the rivers and beneath the waterfalls. Visitors to the island can hike through the jungles, swim in freshwater pools, or, weather permitting, trek to the summit of the highest peak on Cocos Island, Cerro Yglesias. Sturdy kayaks are also available for those who wish to paddle along the Cocos shoreline to experience the breathtaking beauty of the island up close. A trip to Cocos Island would not be complete without the once-in-a-lifetime-experience of taking a true deep sea excursion in The DeepSee, a custom-built submarine that provides guests with an astounding underwater experience like no other. DeepSee takes you to depths previously reserved only for scientists and military personnel—up to 1,500 feet (450 m.), and moves about with agility and flexibility. A pilot and two passengers enjoy a 360-degree field of vision through an acrylic sphere that seems to disappear once you are underwater. You will explore the abyss and see the unique creatures that inhabit the deepest of waters as you visit Everest, The Edge, or The Wall in the area of Cocos Island. Everest is a unique seamount, the base of which is at 300 feet (91 m.) with a peak rising to 150 feet (45 m.). Fed by sunlight, Everest is rich with colorful corals, and a variety of reef fish, sharks, and rays. The Edge is a vertical wall that drops to the abyss. As you descend you will observe how the changes in light intensity appear to change the water color from bright blue near the surface, to cobalt, and to total darkness at depths of 700 feet (213 m.). The Edge promises crab colonies, big groupers, Morays, Mobula Rays, and other critters unique to deeper waters. At The Wall you will descend to depths of up to 1,500 feet (450 m.). With no penetration of sunlight at these depths, the fish, corals, and other fauna you will see have had to adapt to life in total darkness. Critters you may see at this site include Jello-nose Fish, Goosefish, Prickly Sharks, and you may even see an unidentified species. Malpelo Island and its surrounding offshore rocks sit in the Eastern Pacific Ocean, some 235 miles (378 km.) off the Pacific coast of Colombia. Also a UNESCO-designated World Heritage site, this island and its surrounding waters have been recognized by the Colombian government as a protected nature reserve. This small island is actually a seamount, part of a submarine volcanic ridge that stretches some 150 miles (240 km.). With its three major peaks, Malpelo Island appears to be nothing more than jagged, barren rock, but small shrubs, ferns, algae, and mosses have established themselves through nutrients gathered from deposits of bird guano. While the island itself is terrestrially barren, Malpelo’s waters are home to an incredible shark population and other pelagics, making the area attractive for adventure diving trips. 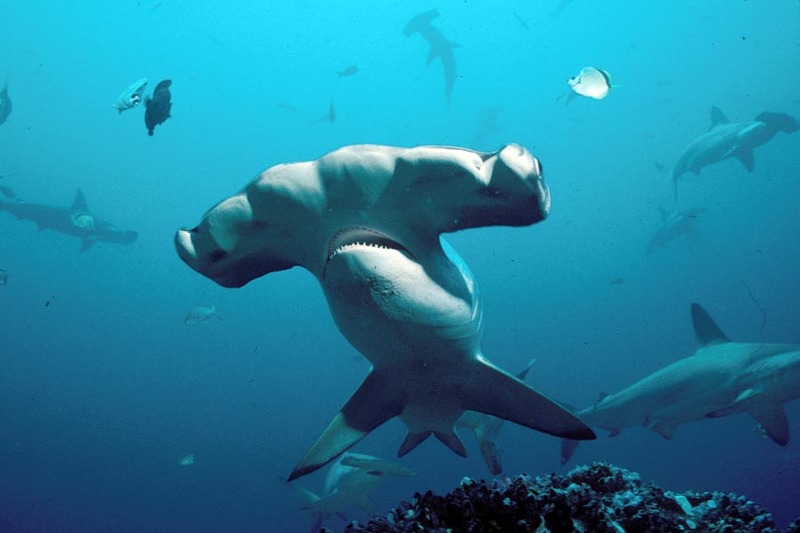 Scuba divers can see hundreds of schooling sharks at a time, among them Hammerheads and Silky Sharks. The variable winds and sea currents in the region determine Malpelo’s climate. Conditions are generally calm and relatively cool from December to May, and warm and rainy from June through November, when the sea is full of plankton. The water temperature averages 79°-83°F (26°-28°C), with sharp thermoclines between 30-100 feet (9-30 m.), depending on the season. Surface temperatures average 82°F (27.7°C). Please note, at present there are no regularly scheduled excursions to Malpelo Island. Undersea Hunter Group accepts only full boat requests to visit Malpelo. Scuba divers traveling to Malpelo Island may visit a number of possible dive sites including The Cathedral, Monster Face, Castaway Coast, The Freezer, The Fridge, La Gringa, The Twins, and Virginia’s Altar. In general, this is considered an advanced dive area. Dive depths vary from one site to the next, and range from 30-130 feet (9-40 m.). Divers will experience tunnels covered in beautiful corals and sponges and filled with a variety of fish, perfectly vertical walls, imposing seamounts, active cleaning stations, pinnacles, and a coral reef that attracts numerous species of fish including King Angels, Damselfish, Moorish Idols, Trumpet Fish, and Goat Fish. The shark population at Malpelo Island is incredible. 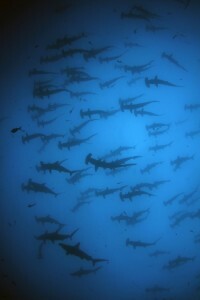 The waters teem with Hammerheads, Whale Sharks, Silkies, White-tipped, and Galapagos Sharks. Other diverse marine life divers may see at Malpelo includes Jacks, Scorpionfish, Eels, Grunts, Eagle Rays, Tuna, Snappers, Creole Fish, Sea Bass, Sea Urchins, Pacific Mantas, Barracudas, and Bigeye Jacks. Getting to Cocos Island from Costa Rica takes 32-36 hours. Trips are 11 days / 10 nights, and include seven full days of diving. The Undersea Hunter Group’s fleet to get you to your dive destination is impressive and incredibly strong. With no detail missed, all three liveaboard boats were specifically designed to meet the rigorous travel and dive specifications of Cocos Island and Malpelo Island. 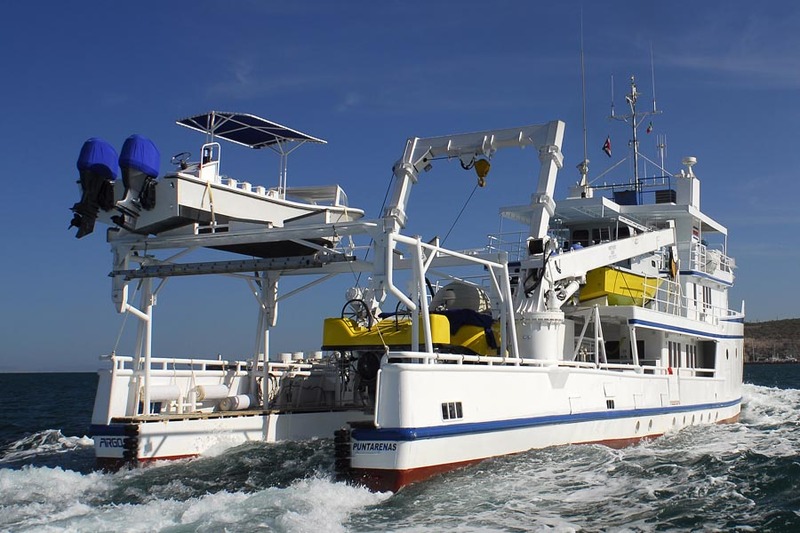 The Sea Hunter, the Undersea Hunter, and the Argo are all spacious liveaboard dive boats, each with its own unique history, and all renovated to accommodate the most discriminating of divers, photographers, and videographers. And, with its innovative and revolutionary design, the amazing DeepSee submersible provides safe, effortless underwater explorations in a reduced, streamlined dive-cycle. The Sea Hunter has been recognized as the “gold standard” of dive boats. This incredibly large and stable liveaboard once served the oil industry in the Gulf of Mexico. It is now a dedicated dive cruiser designed and built specifically for long-range trips, providing a comfortable, relaxed interior. Two spacious suites were recently added on top of the bridge, rivaling, the luxurious staterooms aboard her sister ship Argo. Sea Hunter has 10 guest cabins total, each with private bath, and easily accommodates up to 20 passengers. The Undersea Hunter, with its intimacy and charm, is the smallest of the three diveboats. This liveaboard boat is ideal for special film or research projects, or individual or group charters. The working deck of this vessel is actually larger than those of the other two boats and guest cabins are equally spacious (or larger) than those of the Sea Hunter. Six comfortable cabins accommodate up to 14 passengers, meeting their every need. This boat’s history is varied, ranging from research vessel and submarine support boat to film support boat for several movies. The Argo combines the functionality of a work boat with the comfort and convenience of a luxury yacht. With her heavy lift capabilities, the Argo serves as the platform for the Undersea Hunter Group’s deep-diving submersible DeepSee as well as for deploying remote operating vehicles. Eight spacious and well-appointed suites accommodate up to 16 passengers, and are equipped with TVs and satellite communications. The lounge and dining areas of the Argo offer guests a bit more intimacy. Meals that combine American and local cuisine are served buffet style. Fresh tropical fruit and salads are plentiful, ensuring your meal is delicious and well balanced. Snacks are available between dives. Soft drinks are free and a bottle of wine may cost between $15 and $35USD. If they desire, guests may bring their own hard liquor aboard, as none is available on board. If you have a special dietary need or request, let the crew know and they will do what they can to accommodate you. The design of the dive decks and skiffs of all three boats are identical and specifically designed to meet the needs of serious divers and photographers. Each guest has their own locker for storing all their dive gear and electronics. In addition, every passenger aboard has their own individual camera locker with six outlets and enough space for storing all their photographic equipment. You can also rent whatever dive gear you may need, including 15-liter steel tanks upon prior request. You will be provided with weights for your belt (2-, 3-, 4-, and 6-lbs. / 1-, 1.5-, 2-, and 3-kg.) and aluminum air or Nitrox tanks (80 cubic feet / 12 liters). The scuba diving arrangements are identical for all three Undersea Hunter Group vessels. Heavy-duty fiberglass dive skiffs are used as the primary dive platform throughout your entire trip. Solid, steady ladders make reboarding the skiff easy and convenient. These skiffs provide safety, comfort, and stability in the waters around Cocos and Malpelo Island as well as the power and redundancy required to reach all of the dive sites around the island. In addition to holding all the necessary safety equipment, the skiffs are equipped with racks to hold your scuba diving gear and a sheltered area for storing your camera equipment. For your convenience and ease of access, your personal dive gear remains onboard the skiff the duration of the trip. And, to ensure all divers have optimum opportunity to maximize their dive experience, the skiffs each visit different sites when they are out so there is only one dive skiff at each dive site at a time. You will never see more than one boat above you when diving. The captains and crew members of the Undersea Hunter Group’s vessels take everyone’s safety very seriously. Well-qualified and licensed, they are all very well-trained on the appropriate procedures and guidelines to follow under virtually any circumstance, performing exercise drills on every trip. In the event of an emergency, because a hospital is not immediately available, the boats contain the medical and surgical supplies needed to address a situation promptly, including oxygen. Prior to each dive, a dive master will conduct a briefing to explain a site’s dive strategy and points of interest. You must use the buddy-system when diving and adhere to a 60-minute maximum for each dive. Divers are all equipped with a safety kit containing a large sausage, powerful whistle, a safety light, and a personal radio diver locater system. Decompression dives are not permitted, and the crew imposes a maximum dive depth of 130 feet (40 m.).